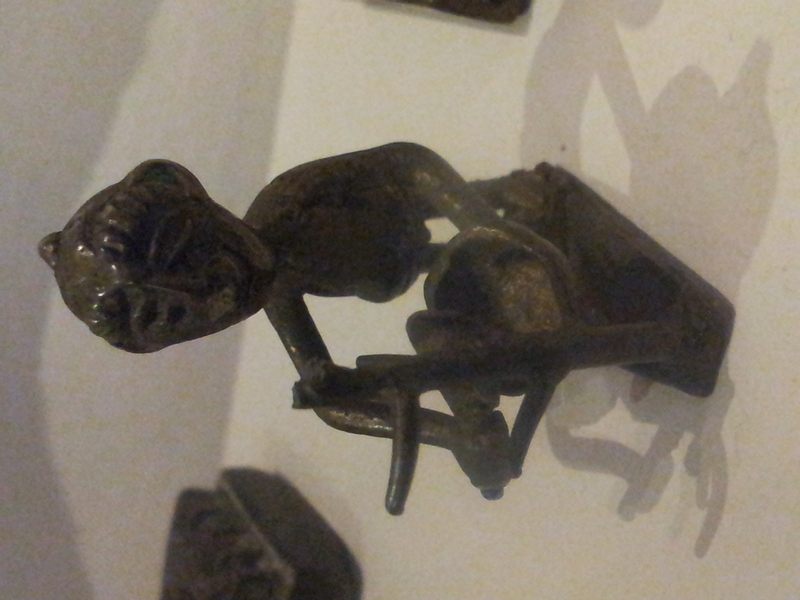 This tiny Ghanaian Gold weighing weight shows a man shaping bark into a bowl. c1860. The 3cm tall weight is made from cast copper alloy was used for weighing gold and shows a lone man cutting bark in to the shape of a bowl. It is roughly equivalent to a depiction of the well-known proverb “Many hands make light work”. It is approximately 150 years old and was found in Ghana and in use by one of the tribes associated with the Akan speaking nations. The Akan reside in the southern regions of the former Gold Coast region now known as Ghana. Akans now have a population of roughly 20 million people. The Akan language comprises a group of dialects within the Central Tano branch of the Potou–Tano subfamily of the Niger–Congo family. The object forms part of the Ponder collection and can be seen in the Explorers Gallery at TorquayMuseum.